I started this blog post over two weeks ago. I wrote the title, then placed the cursor into the body of the post, and promptly commenced staring blankly at the screen. Even now, I'm not quite sure where this is headed. But I do know why it's been difficult to write. Not just in general, since life always seems to throw some curve balls at the TCIE household, but also on this specific topic. It's why I wanted to write about it, to challenge myself, and to challenge my reader to go a little deeper, push a little harder, into a place of discomfort and ickiness. As humans, we just hate that word 'acceptance,' don't we? I mean, the very word implies that we have no choice in the matter. There's not only a surrender of will needed for it to occur, but a certain level of resignation. Oh, that's all fine and dandy, as long as it's somebody else who is doing it! They need to accept that they will never make the Olympic Team at age 40. They need to accept that their grandmother's cancer has spread and there is no more the doctors can do. They need to accept that the store is all out of ice cream. But turn that same mentality onto ourselves, and suddenly "acceptance" becomes a death sentence. We want! We want, we want, we want, and no one is going to stand in our way! And, it works, in most things in life (especially as Americans), that whatever we want, we CAN achieve, with the right mix of skill, money, hard work, and/or simply knowing the right people to ask. But, not all things. That's when it gets truly difficult. Some things are simply absolutes. The store is out of ice cream. It's not personal. It just happened. The next store is 40 miles away, and there's no guarantee they'll have any ice cream, either. Of course, there's always the chance that someone will stop by for a visit and bring ice cream, or that maybe the last quart of ice cream was sold to your husband on his way home from work to surprise you with it. But that doesn't change the fact that we need to accept that the store we are currently standing in is out of ice cream. Sure, we can drop to our knees and say Novenas or Divine Mercy chaplets until we're blue in the face, that maybe someone in the storage room will come across just a pint they hadn't been previously seen. There's nothing wrong with hoping for a miracle. But to expect one? Well, that's the opposite of acceptance. It is the downright refusal to accept the current situation. It would be akin to staying in the store, refusing to leave when they were closing up for the night, and demanding that they keep checking for ice cream. And that leads me to the oft-forgotten topic of this blog: infertility. The way I see it, acceptance has several meanings when it comes to its application of one's infertility status (childless, secondary, inadoption, miscarriage, etc.) The first meaning is the most important: Acceptance of the Here and Now. I've talked a lot about the tendencies in infertility to project into the unknown future or lament and mourn the unchangeable past, and this is a perfect example. What we should be striving for is the acceptance of what is staring us in the face today: we are infertile. Plain and simple. Nothing personal (yeah, I know, it's HARD to feel that way when spirituality is involved). But what good would it do for us to fight that truth of the current situation? Like the woman stomping her feet in the grocery store refusing to accept that there simply is no ice cream left, we wind up working ourselves into a tizzy, feeling worse in the long-run, and wasting time that could be spent discovering happy alternatives ("Ooh, I haven't had Reece's Pieces in forever, but here they are right in the check-out aisle! I'll have them today, and try again for ice cream tomorrow!") Digging our heels in and refusing to "give up," then becomes less about giving up hope and more about giving up our will. I've heard talk of women with infertility scared of Acceptance for this very reason. They are not looking at the Here and Now, but rather, fearful of what that acceptance will mean for their future. "If I "give up," it's like my telling God I don't care anymore, or that I'm ok not having (more) children," is a common mentality. Or, "I'm not ready to accept never having (more) children." What both of these fears bring to light is that God is just waiting for that perfect moment to grant us the desires of OUR will. That if we surrender that will, we will never achieve it. But, acceptance is not about resignation, or even of giving up on our desires. The woman pining away for ice cream need not skip happily out of the store, in her new-found disgust for all things dairy, and go find a turnip to chew on, instead. Rather, she CAN stroll out of the store peacefully, asking that her will be more closely aligned with God's will, and continue to hope that there will be ice cream another day, or maybe something even better, all the while TRUSTING that God knows the desires of her heart and also knows what is best for her. Trust is a HUGE piece of Acceptance, for infertility. Because aside from accepting the Here and Now, we must also accept the past. That may sound silly, at first, since we seemingly have no choice but to accept what has already transpired, but actually, it's not a given. I have many, many friends who have either adopted, conceived, or had successful IVFs after years of infertility, and they still hold a great deal of anger, sadness, and at times even denial over those years of suffering. And this makes perfect sense. Because, just as we know all too well, when it comes to desiring something SO GOOD and so holy as a child, there just is no explanation when we cannot have it. If we think about that woman looking for ice cream, we don't know her whole story. Perhaps her mother is dying at home with hospice, and perhaps she, her mother's only child, remembers hot summer days out on their porch, counting the birds in the trees, and eating ice cream with her mother. Perhaps for the mother, too, these were the very best memories shared with her daughter. And perhaps, from her deathbed, her mother said, "It sure would be nice to share a bowl of ice cream with you, again." Of course, by thickening the plot, suddenly we become much more emotionally invested in this woman's ability to procure some ice cream, and procure it quickly! She simply doesn't have the time to travel to more stores, hoping they will have some. Yes, she can hope that someone will drop by with ice cream, but now that likelihood seems ridiculous, doesn't it? A LOT is hinging on this ice cream, as a mother and daughter's parting wish. And a lot hinges on our family, growing by a whole new human life... or not. But if that woman goes back to her mother's side without ice cream, what good will it do for her to continually beat herself up over it, long after her mother has passed? She did her best. It was not in her hands. And the moments shared together remain beautiful memories. So, too, we need to allow ourselves to accept our past infertility. We need to FORGIVE ourselves the guilt we feel over "if only I had done this," or "maybe if I had started sooner..." and a host of other maybes that have already come and gone. It does no good to anyone, especially ourselves, to not accept our past. Again, it doesn't mean we need to laugh and joke and diminish any pain that was felt. Actually, that's the opposite of acceptance, too; it's pure denial. 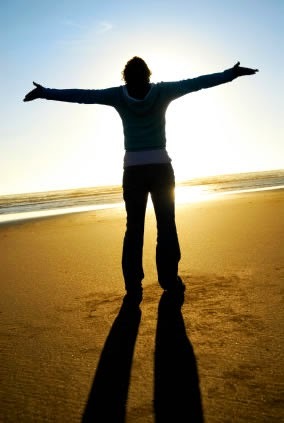 But we also should not allow our past emotions to dictate our present state of mind and body. Accepting the past is the only way we can continue to practice acceptance in the Here and Now, and into the future. Which brings me back to trust. That third meaning of Acceptance for infertility, as you may have guessed by now, is about how we accept our unknown future. How does one accept anything unknown, after all? Would you close your eyes and hold out your hands if a 5 year old boy (who wasn't your son or student) said he wanted to give you something? I'm thinking no. We are never ready to accept the unknown, because the unknown could be absolutely horrible, disastrous, scary, painful, and depressing. But this kind of Acceptance thickens the plot, again. Would you close your eyes and hold our your hands if the child Jesus said He wanted to give you something? That's what we are expected to do, when we Accept the unknown future. It's not about resigning to the fact that we will never get what we want, or that what we WILL get will be our worst fear realized. It's about TRUSTING that whatever happens, we can make it through with God's help. I spent so much time digging my heels in and refusing to Accept, for what I thought were the right reasons. Not giving up meant my hope was alive, and I would never lose hope. But, I tell you, my hope multiplied like the seed that FINALLY fell on good soil the moment I came to a place of Acceptance with infertility. I hope and pray all of us can find Acceptance in all areas of our life. You are so right, acceptance can be scary. Its hard to come to terms how acceptance is not a denial of our hopes for the future. This is encouraging: " my hope multiplied like the seed that FINALLY fell on good soil the moment I came to a place of Acceptance with infertility." 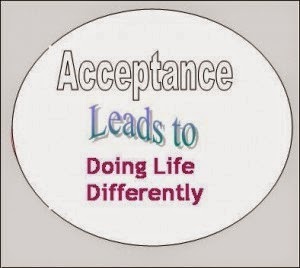 Just another great post on the trials of IF...it is about acceptance. If this current adoption journey ends childless...we're done. I'll have to accept having a broken heart. I'll have to find a way to move on. I don't know what in life could be more fulfilling...but maybe God has a plan. I doubt the plan will fill the void of not being a mother. So far, nothing has filled that void. I do believe the cross of IF will always be part of my life even when I'm 70 for my friends will have grandkids (or great grandkids) to brag about and I'll still have my cats. There is so much about the future without kids that does scare me...I dread it. But I have to live and I do know...I did all of this for God and that is good. If He did not see me worthy of the gift of children...then I have no choice to but to accept..and live. Maybe IF is my purgatory here on earth. Thank you for sharing your thoughts so eloquently. God bless. Thank you for sharing. I needed to read this today. You write so descriptively and always bring up things I've never ever considered. I do feel like I have more hope after I've come to a place of acceptance of infertility. I feel like I have more drive to enjoy my life day by day, not thinking what about tomorrow or what about a year ago. Today I am infertile, tomorrow is not for me to worry about. Great post! I have to agree that as I have started to find some acceptance, I actually have more hope than I did before. I thought the exact same thing, though, that "acceptance" meant that I would never get what I wanted. Rather it means that it could still happen, but it allows me to live the life that I have now. I am noticing that I think less in terms of "waiting" for what I want and more in terms of living the life that I have now. Thanks for another wonderfully written post! "Rather, she CAN stroll out of the store peacefully, asking that her will be more closely aligned with God's will, and continue to hope that there will be ice cream another day, or maybe something even better, all the while TRUSTING that God knows the desires of her heart and also knows what is best for her." I don't believe it's occurred to me before to pray that my will is more closely aligned with God's. I've simply prayed my understanding that it's His will, not mine, that is to be done. This is very timely for me, as it fits in beautifully with my upcoming consecration to Mary for the first time! This is wonderful! Just what I needed to read today! I think God has been working on acceptance with me, without my noticing. I've had to accept a lot of changes in my life lately and maybe that was preparation for accepting IF. I just loved your line about would be close our eyes and hold out our hands for the child Jesus. Made me tear up.